hi dear please need ur little help please kindly tell me i am working on fingerprint scanner i am able to get image from it but not able to compare them . Is this form capable to match and tell me the result of matching?? kindly reply i need ur help ? First of all, thanks for the code. I am a fourth year student in Comp. Science. I trying to use your code for recognizing blood cell images. 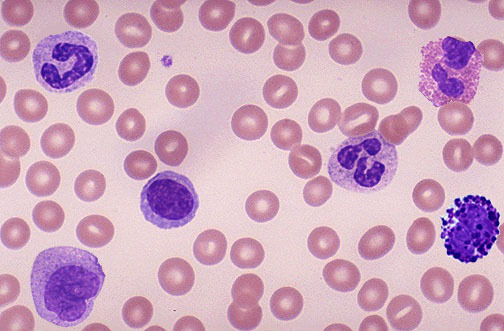 I kept about 5-6 different blood cell images in the patterns folder and trained the network(I have extracted the images from the following pic..
Then i browse 1 of the above extracted images and try to recognize it. It gave error value 15 and the iteration value kept on increasing till 10000 without reducing the error. Why is this happening? Are there any size constraint or because they are too similar?? Waiting eagerly for your reply. As I see there are two different patterns at the image. However, if 5-6 patterns are used on training, the result may not be sufficient. Anyway, only 2 training images can be used to identify two patterns on this implementation (You can change the implementation to accept more that one training image for a pattern). I had the same problem. I think that's because the size of your image. As the size of image is used as the number of neurons for the input layer, if you have for example a 200x200 pixels image, you're going to have 40.000 neurons. For my application, I had to reduce the image to the size of 40x40 pixels, and then it was able to recognize it. By the way, I'm building an application that recognize fingerspelling. i'm want ask for this project.. i'm sorry i'm newbie..
1. where i can find or see result of "training" during the training data is calculated?? 2. when i click "load network" is an error? error message : Object reference not set to an instance of an object. Hello! Thank you for your helpful program. I have a few questions about this program. 1. In this program, there are 2 buttons - 'save network' button and 'load network' button. what are these buttons? When I use your program, I don't need to click these buttons to operate the program. And.... When I click the 'load network' button, I could load 'sample.net' file. but, there's no change in program. what these buttons are used for? 2. As you said in source code, to modify initial weight, 'x' and 'y' can be changed. But I don't know the meaning of these variables. Is there any meaning or standard(sth like that) to determine these variable? save network serializes trained network weights to a binary file, likewise load network operation loads network weights from a serialized binary file. They are just because to store trained network weights into a file in order not to make it necessary to train the network with the same parameters again. 2nd quest is related to initial weights on backpropagation network and there is not a certain rule about this. As I remember they were affecting duration of training process (gained experimentally).. Thank you for providing so useful things. I heard that neural network uses training for find most similar image. So I tried to find similar image with simple tree images. Its' size is not that big and grayscale images which is very simple. But it does not find well. Does your program have a code which do training? or has already trained with another ways that I don't know? Whot do these hight and low mean? when i draw a 'S' in the picturebox, Hight shows me 'G' and Low shows me '6'. Why is that so? How long and with what settings should i train it to display accurate results? High (output) is the best picked character and low (output) is the second matched one. The letters that have common features may not be recognized correctly and that is normal. Train 2 by 2 and Then Join the .Net file ? First off: Great Work! Greatly appreciated, have learned a whole lot and has been tremendously useful on my personal project. 1. Would it be plausible to pause training and save and later on resume ? 2. Would it be possible to train by only training 2 images but with great nodes and hidden layers, and then mix the .net training file ? 3. Would it be better to train only the skeleton of the pattern or include color and other partial content of the image. 4. Final thing How could I increase the accuracy for nearly 2 very similar but only different by small details images. Thanks ! I know these are many questions, but if you can I would appreciate any thoughts or short comments! Re: Train 2 by 2 and Then Join the .Net file ? I hope those helps. good luck.. Thanks, This actually did help, I was able to achieve my desired goal. Again, thank you so much for you're contribution. n also what do the iterations signify ? what do high n low signify during pattern matching ? Re: high n low ? How can i know what is desired output of each node? i ve one confusion...if i want to make a NN for pen recognition, how can i know the desired ouptup of each node? ?how the output of each node can be computed? No, I didnt use any complex number form as input-output. in your Image Recognition with Neural Networks article, i have a question in identification process. what value that you compare in that process? is it pixel or biner? thanks a lot for your answer. As input, array of pixel values [of image] is used for identification [just by checking the code].